Brian has been teaching a wide variety of subjects for the York U. Music dept. since 1994. Mr. Katz is an internationally acclaimed guitarist, composer and educator, and a highly skilled pianist and vocalist. 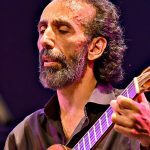 As a performer and composer he is noted for bringing classical and world music influences to modern jazz and is highly regarded as a “free” (open) music improviser, where he blends many of his influences into coherent musical statements.